Create the illusion of curves with this 8 inch Curvy Log Cabin Trim Tool. Sew four blocks together to “piece” a circle. Sewing narrow strips to two adjoining sides of the center square and wide strips to the remaining two sides create the curve. Mark the wrong side of the center square through the holes on the template to ensure a perfect seam allowance. Then sew a round – two narrow and two wide strips – and trim. Add two more rounds to complete a perfect 8 inch finished block. 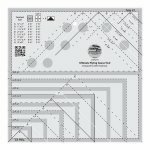 The cutting requirements for the center square and the narrow and wide strips are printed right on the ruler. 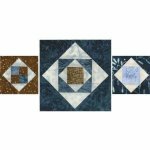 Sew four blocks together to “piece” a circle which finishes to 16 inches. 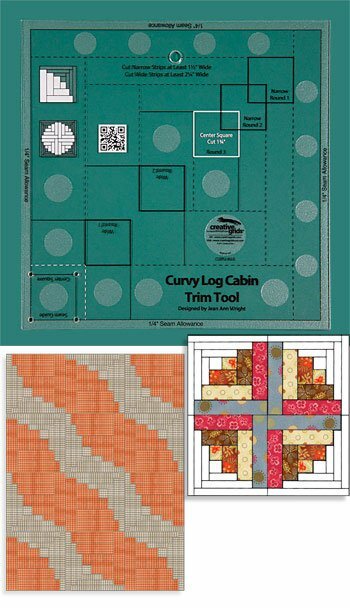 Combine these blocks with traditional 8 inch log cabin blocks created with the Creative Grids Log Cabin Trim Tool (CGRJAW1) for unlimited design potential.